If you’re a member of Apple’s $99-a-year MobileMe service (formerly .Mac), you can publish a photo album in the MobileMe Gallery. Tap a picture and make sure the picture controls are displayed. Then tap the icon at the bottom left (the one that looks like an arrow trying to escape from a rectangle). That displays the four choices shown here. Tap the Send to MobileMe option. 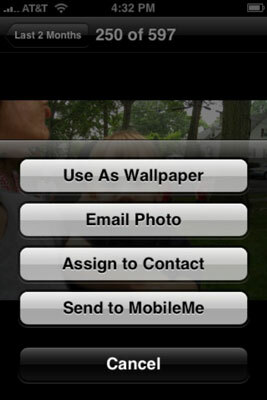 Tap the Send to MobileMe option and tap the appropriate Gallery album to which you want to add the picture. Enter the title of the photo in the subject heading of the e-mail message box that appears. You also have to check an Album Setting box in the Gallery that has a strangely worded label: Adding of Photos via e-mail or iPhone.